"Measure the read and write speed of your PC with Parkdale." Parkdale is an awesome benchmarking application from the SZ Development Team that allows its users to measure the read and write speeds from their hard disks, cdrom devices, and network servers in kilobytes, megabytes, and even gigabytes per second. 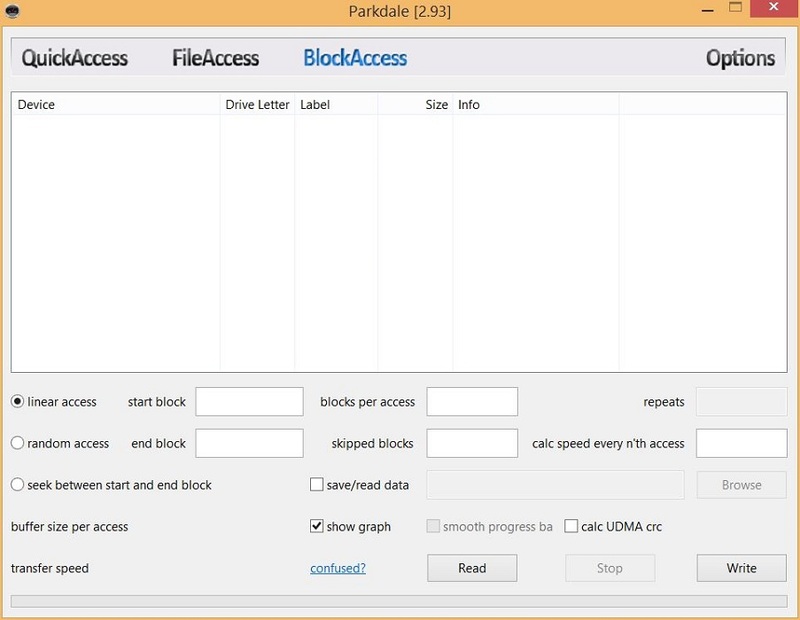 Parkdale includes three different modes for capturing this data and they range from easy to advanced: QuickAccess, FileAccess, and BlockAccess. Each mode has similar, but uniquely different tasks that it completes and their various options differ as well. The first of the three modes, and the simplest is the QuickAccess mode. In this mode, you are only required one input, a click. It is a single click speed test using the filesystem. It will test both the read and write speeds of the filesystem and the random access memory (RAM). It uses 4KB blocks and 32 concurrent threads. You can select multiple drives that will be tested sequentially, one after another. The results will then be written into a log file for you to access and review later after the test. You can use this log file to easily compare multiple drives. Parkdale supports both HDD and SSD drives and you can select from them within the selection menu before you begin the tests. The second mode, FileAccess, allows you to also test the read and write speed of your filesystem, however it tests the read and write speed from and into a normal file. Now this mode does come with a few more options than the QuickAccess mode and it also allows you to test specific files rather than just the filesystem itself. You have a small text window where you can enter in the path of the test file, or you can select it using the viewfinder at the top half of the application window. You also have two checkboxes which you can select between the two telling the application whether to use the fastest file or the biggest file. There is one more checkbox on the left side of the mode that allows you to access some expert settings. Inside, you can choose to save the read data, specify a block size, choose whether or not to use buffering and more. The third and last mode in Parkdale is the BlockAccess mode. Like the other two modes, BlockAccess tests read and write speeds. Where they differ is that, unlike the first two modes, in the BlockAccess mode, test data is read from and written onto the disk sectors directly without using the filesystem with a graph that shows the transfer rate over time. The BlockAccess mode gives you more options that the previous two modes and a bit more flexibility in the options as well which brings you more detailed test results. To make things a bit easier within the application, Parkdale has a few function keys and command line options available to speed up your testing. Learning and using these functions and command line options will help you speed through tests and get results faster than simple utilizing the application itself.